ALA boys Czar Amonsot and AJ Banal had a public workout and sparring session inside the ALA Gym at the Banilad Town Center this Saturday afternoon. 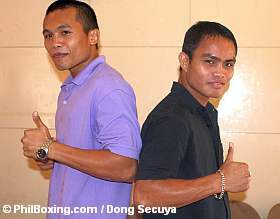 Fans had a chance to size up the two boxers preparing for their January 31 bouts in Bohol against Indonesian opponents. Amonsot sparred for three rounds against Alde de Zosa. The southpaw from Bohol showcased a powerful right hook that repeatedly rocked his sparring partner. Banal, also a southpaw, showed excellent lateral movement and crisp combinations against Ali Belonguel for three rounds. Both fighters showed no signs of ring rust and Bohol fight fans can expect an exciting slam bang affair at the Island City Mall in Tagbilaran City next Saturday. The Bazooka from Ermita will be facing Nouldy Manakane while the Czar of Bohol will face Zoel Fidal.